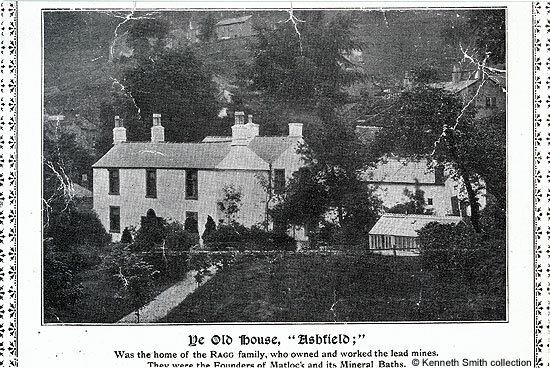 Both William Adam and Timothy Spencer Hall described The Villa as the oldest building in Matlock Bath in the mid nineteenth century and the above card tells us it had been the home of the Ragg (or Wragg) family who were "the Founders of Matlock and its Minerals". George Wragg was one of the four men who built the first bath in 1698 (see Water Cures). The house became known as "Ashfield" towards the very end of its life, the name shown on the advertising card above and below, but before then had been called The Villa. The property was a board and lodging house that was run by John and Elizabeth Broadfoot for over 20 years in the middle of the 19th century. They were living in Matlock Bath by 1835 and had moved to The Villa by 1840 as they are mentioned in "Gem of the Peak". They advertised in trade directories throughout the 1840s and 1850s, continuing to advertise until 1864. Their daughter Mary was also with them in Matlock Bath until she married John Richardson at St. Giles' on 14 Dec 1854. Elizabeth Hind Broadfoot had been a member of Glenorchy Chapel and can be found in their membership lists. Unfortunately, like a number of local businessmen, John Broadfoot encountered financial difficulties so the couple left Matlock Bath and moved to Southport where John died in 1870. After her husband's death his widow moved to Sale to live with the Richardsons and passed away in 1891; she was buried at Chapel En Le Frith on 24 Apr 1891. The building had been used as a school for at least ten years before the Broadfoots moved in as Sarah and Jemima Cox ran a ladies boarding establishment at the house. Mrs. Richard Coates followed on from the Broadfoots but it is unclear who was here in 1881 as the Matlock Bath census enumerator did not record proper addresses. In 1891 John Wright, the headmaster of Trinity middle school was in residence. In 1892 this substantial property was advertised for letting and was described as being "delightfully situate, and commands charming views of the High Tor and the valley of the river Derwent". As well as the main house, the property had a "Cottage, Stable, Coach House, good garden, and Paddock adjoining" in grounds of over an acre. There was also a cow house with over 4 acres of land and a "small Lock-up Shop, for some time occupied as a butcher's shop". The Stones family were the last to live here and must have renamed the property; they were recorded as living at The Villa as late as 1899, although the 1901 census shows them as being at Ashfield. The house was demolished in 1908. It seems a sad end for such an historic property. A map from 1900 shows "Ashfield" as a large plot on the Matlock Bath hillside below Guilderoy, with Waterloo Road running along one boundary. After the house was demolished the land remained undeveloped for some years. The extension to Temple Walk, at first called New Road, was not begun until the 1920s. with the cottage alongside, dates from Mr. Broadfoot's time. The same picture was published in "Days in Derbyshire". Cards in the collection of and provided by and © Ken Smith. See both William Adam's "Gem of the Peak" and Chapter 4 of "Days in Derbyshire". 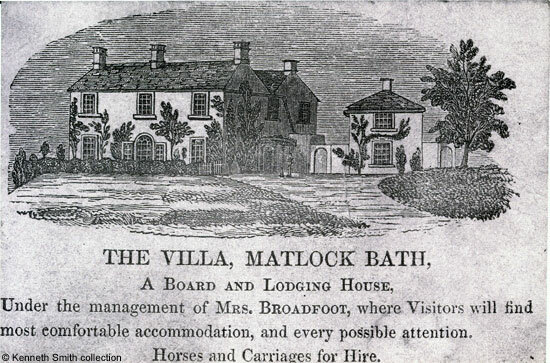 John and Elizabeth Broadfoot were in Matlock Bath at the time of the 1841 census | the 1851 census | the 1861 census, although their home was not named. John Broadfoot was shown keeping a lodging house on Museum Parade in 1835 (this from "The Matlock Companion" of that year). Pigot's 1835 Directory records Elizabeth Broadfoot as a Lodging House Keeper but gives no address. Adam's "Gem of the Peak" of 1840 shows them at The Villa. The Broadfoots advertised in various trades directories. See Pigot's 1842 Directory (the address was not provided) | Bagshaw's 1846 Directory | Kelly's 1848 Directory | White's 1852 Directory | Kelly's 1855 Directory | White's 1857 Directory | White's 1862 Directory and Kelly's 1864 Directory. Mrs. Broadfoot is also shown on Matlock Bath: Glenorchy Independent Chapel Members. John Broadfoot encountered financial difficulties - see Names in the London Gazette, 1867. The Villa was shown as a school in Pigot's 1831 Directory | Pigot's 1835 Directory | "The Matlock Companion" | Pigot's Directory 1842, when it was run by the Cox sisters. Also see news-cuttings-notices-and-announcements-1832 which announced their arrival. The Cox sisters were not in Matlock Bath at the time of the 1841 census, nor were they listed as running a school in Adam's "Gem of the Peak" in 1840 (the Broadfoots were there). So it is strange that they advertised in the 1842 vesion of Pigot's. Kelly's 1876 Directory | They were in Matlock Bath in the 1871 census but later moved to Matlock Dale. See Mr. Wright, the schoolmaster in the 1891 census and in Kelly's 1891 Directory. "The Derby Mercury", Wednesday, 27 April, 1892. The Stones were recorded in Matlock Bath in Kelly's 1895 Directory and Kelly's 1899 Directory. They were listed as living at Ashfield in the 1901 census. Two sons of the family died in the 1914-18 War. See: Matlock's WW1 Casualties Not Listed on the Matlock Memorial. 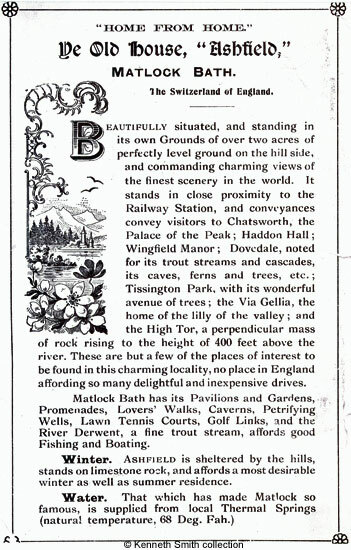 See the Advertisement for The Villa, Matlock Bath.